Many of you will know what the Circuit of Ireland Rally is from my pictorial and editorial coverage in here over the years, and indeed it is one of the world’s oldest and once toughest rallies around. Ran for years by the Ulster Automobile Club (UAC) it went from strength to strength and died off over the years, returning to full bloom in the last few years again. So you know the club, and you know the flagship event they host each Easter, but what is the Retro Rallying title about? Well the UAC also host several other motorsport events each year and these events will cover various initiatives within the sport. These initiatives all come with varying machinery, skill levels and above all else; cost. We all know that stage rallying can be an expensive sport. On top of buying a car, you have the added expenses of maintenance, entry fees, fuel, keeping numerous items of important safety equipment ‘in date’…the list goes on. However, there is something to suit everyone’s budget within the sport and while stage rallying can be more expensive, you can start competing in other forms of motorsport from as little as £20 and experience the same thrills in nothing more than your road car. This now brings us to Clandeboye Estate in Bangor in particular; Clandeboye Sawmill close to the entrance to the estate and the annual “Circuit of Ireland Retro” event which for the last few years has held a test around the sawmill, with stunningly beautiful autumn colours and freshly chopped trees as a picturesque backdrop. 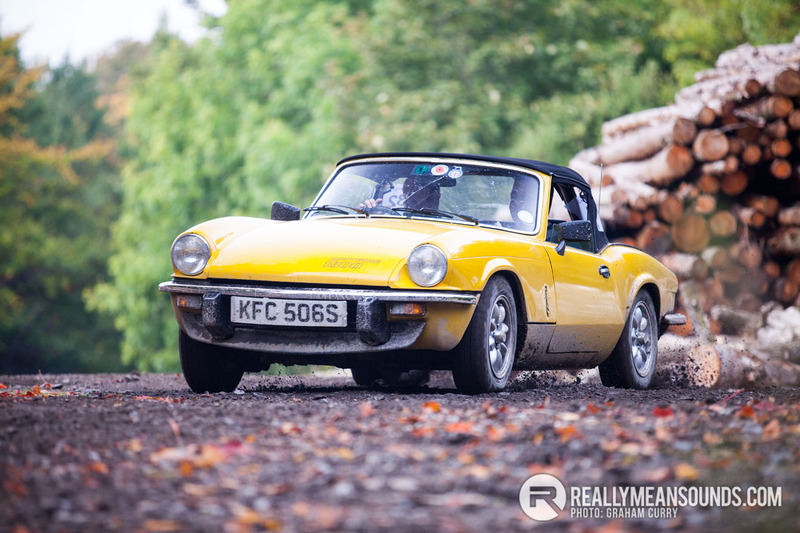 This Retro Rally is more commonly known as Targa Rallying, and is a step away from full-on stage rallying but they maintain the same ethos – drive as fast as you can from point A to point B. Others within the sport depending on age group would perhaps call this type of event a “Multi-Venue Auto Test” or perhaps even a “Lanes Rally”, either way the events are more or less all the same format. So what is a Targa Rally? There are some similarities between a Targa Rally and a Stage Rally. Both disciplines require a driver and navigator in a car but in a Targa Rally, competitors can use standard road cars (popular cars include Mazda MX5s, Nissan Micras, MG Midgets etc) without the need for race suits, helmets or roll cages. Entry fees usually start from around £50 and events consist of a variety of ‘tests’ located on farmer’s lanes where competitors must take the correct route around cones without touching them. Think of a cross between production car auto testing and stage rallying but without the high speeds. Get the idea? Standard road cars are permitted – you can drive to the event (if you have a full driving licence, tax, insurance and MOT! ), compete and then drive home again. It’s very cost effective and it really is great fun. For the most part, motorsport events will have a trailer park to accommodate the cars and trailers that bring the competition car to an event however with these clubman events 95% of entrants will drive to and from the event via the public highway. The COI Retro 2015 ran smoothly and was based out of Harrison’s of Greyabbey with the start/finish and lunch halt being held there (I can imagine times in the afternoon were slower after an amazing feed within the cafe) with several tests around the Ards Peninsula and Craigantlet areas throughout the day. Brilliant, need to get in to something like this. Good coverage Graham. We've decided to give them a go and have entered our first one run by Ballynahinch Motor Club in a few weeks time. Nice pics and write up. That circuit looks like its a blast! | Good coverage Graham. We've decided to give them a go and have entered our first one run by Ballynahinch Motor Club in a few weeks time. I done it a lot of years back, it was great fun ! Nice write up Graham! For anyone that's interested, there's a handfull of RMS'ers that take part. General information and craic about these events over recent years in here... Lanes/Targa Rallies | Good coverage Graham. We've decided to give them a go and have entered our first one run by Ballynahinch Motor Club in a few weeks time. If it's anything like last year it'll be a great event, hope you's enjoy! I'm sure we will do @DavyC really looking forward to it. We've been doing night navs most recently but unfortunately the last few haven't ran so hoping the lanes are the answer to regular competition without breaking the bank. Prior to night navs we did stage rallying until it was no longer financially viable! For any locals interested, this event returns to the Ards Peninsula again this year, Sat 8th October. Run by the Ulster Automobile Club and renamed the Equinox Rally. Pretty certain the Clandeboye sawmill (see Graham's report) will be used again.